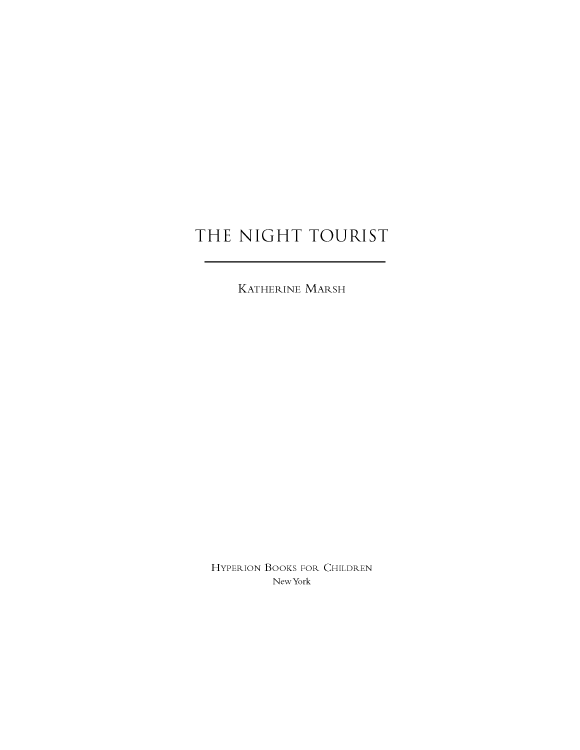 READ The Night Tourist FREE online full book. All rights reserved. 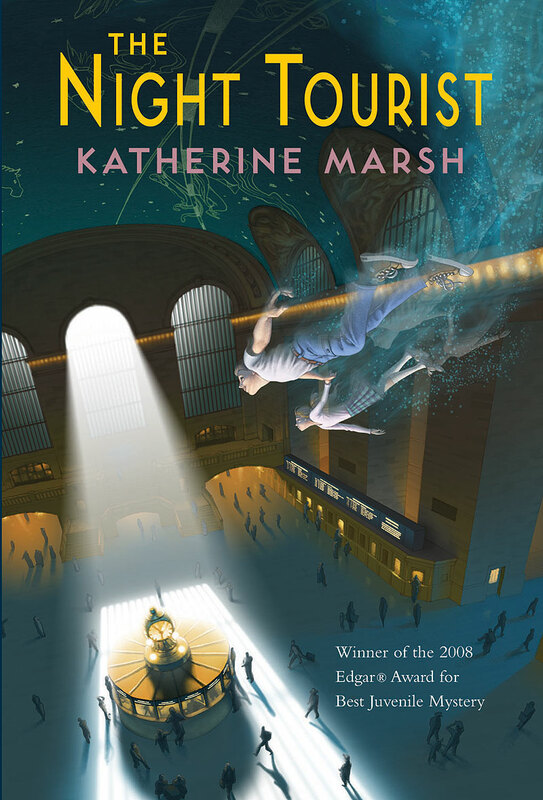 Published by Hyperion Books for Children, an imprint of Disney Book Group. No part of this book may be reproduced or transmitted in any form or by any means, electronic or mechanical, including photocopying, recording, or by any information storage and retrieval system, without written permission from the publisher. For information address Hyperion Books for Children, 114 Fifth Avenue, New York, New York 10011-5690.
. Although he was only in the ninth grade, he had an after-school job helping the head of the university’s Classics department on her new English translation. It was the day after Christmas so there were no professors around, which meant that there was no reason for Jack to look up out of his book. But suddenly he heard a shout. Jack stopped walking and looked up. A girl in a puffy blue parka was running toward him across the brick walkway between the Yale library and Elm Street. Her hair was in braids, and she was frantically waving at him. “Oh,” said Jack. He knew who she was, but, like most of the kids at Hyde Leadership High School, she’d never spoken to him before. Jack gave a noncommittal shrug. He’d actually read it a few years earlier. “You live here, right?” Tanya pointed vaguely at the stone residential colleges, which surrounded the walkway on either side. “Not really,” he murmured, though he usually did. “Oh my God, I’m so sorry!” said Tanya. “It happened a long time ago,” he repeated. Eight years ago this month, he thought, but didn’t say it. He looked down at the book in his hands. Jack held up the book so she could see the spine. and started walking toward Elm Street. He’d heard it all before. could mean that the snake “killed her” or “cut her down,” but it could also mean that she “perished.” Some people might not think there’s much of a difference between these possibilities, but Jack did. You could perish in an accident and no one is to blame. But when you’re killed, a killer— in Eurydice’s case, the snake—is at fault. Jack stepped onto the crosswalk, his feet feeling ahead of him as his nose stayed pointed like a weather vane into his book. “To be killed, to perish,” he murmured, weighing the possibilities. Just as he registered the grammar and settled on the word “perish,” exonerating the snake from any intentional wrongdoing, he heard Tanya shout, “Jack!” But he lifted the book closer to his face, pretending not to hear. The next thing he knew, there was loud, heavy metal music, and he was knocked off his feet and into the air. Jack barely had time to register what had happened. He caught a glimpse of the car that hit him, heard panicked shouts, and closed his eyes as his body hit the ground. A loud rushing sound filled his ears. Then he blacked out. Jack’s eyelids flickered. This voice was his father’s. Jack could hear a loud sniffle. Even in his semiconscious state, he wondered if his father was going to cry— the way he did late at night after Jack went to bed. The one time Jack had mentioned it, his father had stiffened and told him that he had been dreaming. “Thank you,” his father said softly. There was the sliding noise of a curtain being closed as the doctor departed. With great effort, Jack opened his eyes. He was lying on a cot surrounded by a white curtain. He looked at his father, who was blinking back tears. Jack nodded, unable to explain. Jack paused. His father hardly ever talked about his mother. And Jack never mentioned her, even though he had hundreds of questions. He wished there were someone he could ask about her, but there was no one else in New Haven who had known her. Neither of his parents had siblings, and his grandparents had died long ago. Jack tried to stay awake in case his father wanted to talk more, but his silence—punctuated by the beeps and pages of the hospital—seemed only to grow louder and more resolute. Finally, Jack gave up, and closed his eyes. At first, when he woke up, he didn’t know if it was day or night. The fluorescent light of the hospital hallway was inconclusive. His father was lolled in a chair by his bed, snoring. The white face of the clock in his room read four a.m. A nurse in a white uniform stopped in front of the door to his room to greet an emaciated old man in a hospital gown. Jack closed his eyes and tried to fall back asleep, but he couldn’t help following their conversation. “My brother died in New York,” said the old man. Jack thought he heard the nurse say, “We should all be so lucky.” But that seemed like an odd thing to say. “Maybe I’ll join you. Nobody’s dying here,” said the nurse with a laugh. Jack smiled with relief as he realized that the conversation didn’t make any sense because he was dreaming. The next morning, Jack came home from the hospital. He and his dad lived together like two bachelors in a corner apartment in Saybrook, one of the gothic stone residential colleges at Yale. The apartment was filled with books, primitive paintings, and lesser archeological finds. There were piles of ancient Greek drachmas, squat stone vases, shards of bone, plant fossils, broken spearheads, naked faceless figurines, and staring masks that had once been used in religious rites. His father also collected modern trinkets from the places he had gone on digs—Turkish tea sets, hookahs, wooden eggs, African flutes, even a voodoo doll that made Jack shiver whenever he walked by it. Jack was a little sore, but otherwise he felt fine. Still, his father hovered over him, insisting that he stay in bed. Jack didn’t mind—he liked his room, which had a window looking out over the stone courtyard below. His floor was littered with dirty clothes and crumpled-up attempts at translations. His walls were covered with maps of countries that no longer existed: the Soviet Union, the Ottoman Empire, Austria-Hungary. He had started the collection with a map of Zanzibar after his mother died. On his dresser sat a silver frame with a photo of her—a pale, dark-haired woman standing on a New York City street corner. The photo was slightly overexposed, but Jack liked his mother’s intense gaze and the way her eyes seemed to follow him around the room. before he yawned and closed the book. Minutes later, he was asleep. When he woke up from his nap, it was dark. An icy rain pelted the window. The room felt airless, like the inside of a submarine. He stood up, bleary-eyed, and opened the window. Cold air rushed in. The stone courtyard looked slick and shimmery. Grabbing a sweater, he padded his way into the living room. “Dad?” he called out. No one answered. He wondered if his father had gone out. Jack walked past the piles of drachmas and fossils and looked out the window into the opposite wing of the college. Usually he could see students moving across their rooms or the blue glow of their computer screens. But everyone was away, and there wasn’t a single light on. The only face he saw, reflected in the window, was his own. Again there was no answer. Jack tiptoed past the voodoo doll and toward his father’s study. Through the door, he could hear the steady crackle of opera music from the classical station his father always played. As the chorus picked up, Jack took a deep breath and slowly turned the doorknob. He opened the door a few inches and peered into the study. The first thing he noticed was that the window had blown open and pellets of ice were landing on his father’s desk. The same gust of wind that had blown the window open had probably slammed the door shut as well. Jack grinned. It was nothing but a storm. He began to walk across the study toward the window. But three steps in, he froze. Reclining on the leather couch, his shoes propped up on the armrest, was a lanky man with gray, disheveled hair. Jack stared at the stranger, but the man took no notice of him. He studied a piece of paper, tracing something on it with his finger. “Who are you?” Jack asked. With a loud shout, the man leaped off the couch and dropped the piece of paper. His eyes bulged at Jack. For a moment, they just stared at each other. Then the stranger ran to the open window and, without a word, jumped out of it. Jack dashed to the window and looked out at the courtyard. There was no sign of a body. The courtyard was empty. He slowly closed the window, leaning on the sill for support. His legs felt weak, and his pulse throbbed in his temples. He thought that he might be dreaming again, but when he poked the bruise on his leg, it definitely hurt. As he stared at the mess of papers on his father’s desk, he realized that the top drawer—which was always locked—was open. As he touched the handle, a shiver shot up his arm. The wood felt as cold as a handful of snow. He banged it shut and jerked his hand away. There was a crash from the other room and the sound of heavy footsteps marching across the apartment. Jack imagined the man who had jumped out of the window returning, his head bashed in from the cobblestones, his hands reaching for him. He scanned the study, frantically looking for a place to hide. But there was no time; the footsteps were right outside the door. He swung around, his fists raised. “Go away!” he shouted. Jack lowered his fists and took a deep breath. “Dad,” he said, his voice shaking. “Of course it’s me. Who else would it be?” his father asked. “I just went out to get some dinner. What’s wrong? Are you okay?” He gave Jack a strange look. It’s just a strange man was sitting on the couch and then he jumped out the window. . . .
No, he couldn’t say it. His father might take him back to the hospital, this time to the psychiatric ward. Jack nodded and his father left the room. There was only one rational explanation for what had happened. His brain had been damaged by the accident. The man and the open desk drawer were hallucinations. But then Jack’s eyes fell on the piece of paper that the stranger had dropped, which was still lying on the floor. Jack wondered if the man had taken it from his father’s desk. He tiptoed over and gave it a poke. It didn’t vanish or jump out the window. He picked it up. Sanitary & Topographical Map of the City and Island of New York. Prepared for the Council of Hygiene and Public Health of the Citizens Association Under the Direction of Topographical Engineer Egbert L. Viele.